In the weeks leading up to our flight to Morocco, it became clear that most of our friends and family – and well, let’s face it, neither of us – had many ideas of what to expect from this country. It’s a nap and a cup of coffee or a mere 4 hours’ flight from Copenhagen but boy, does it feel like a journey to outer space at first glance. In other words, Morocco was the perfect place to kick off our 2016 travels! Let’s get started – or as we say in Danish, let’s shave the goat. During the 20-minute drive from the Menara Airport to the old town also known as the medina, you are guaranteed to see camels, donkeys, monkeys (with diapers! ), snake charmers and henna-painting women along with of course men and women dressed in a variety of traditional garments. This is too much to take in for a person that started the day at 3.45 AM in a pitch-dark, snow-covered Copenhagen suburb so after our cab driver dropped us off at the medina’s central Jamaa el Fna square we basically walked straight to our hostel only a few minutes away. Time to venture into the Souk! After recovering from the initial onslaught we ventured into the local souk. Words can hardly describe how absolutely amazing the sensory fireworks are and how absolutely horrifying the hassling is. From the minute you step into the chilly, shaded world of goods and start hearing the constant soundtrack of mumbling men around you, you know you’re in for a treat. 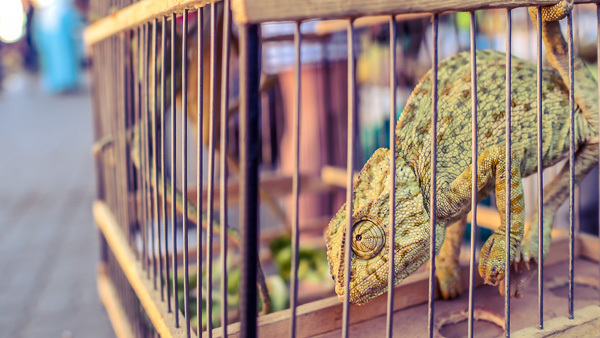 Narrow alleyways will take you through a labyrinth of leather bags and shoes, geckos, turtles, spices, tea, dyed scarfs, belly dancer dresses, live chickens, golden lamps, carpets, jewellery and a food market shrouded in barbeque smoke. And of course you get all of this at air-conditioned prices, as one of the sellers so eloquently put it. Mind you, though, that in this real-life Aladdin movie these air-conditioned prices are just a hook to some blatant ripping-off if you don’t keep your backpacker wits about you. Now, strolling through the souk and actually making a purchase at the souk are two very different things. At first, it’s nothing but smiles and asking where we might be from. As Liam and Mariana are apparently not common Moroccan names we were quickly renamed Ali Baba and Fatima to make it easier to bond with our many local friends in the souk. Either that or the sellers just wanted to distract us while they were putting what they led us to believe were outrageously cheap scarfs on our innocent heads. If you make a comment to a shop owner about how his goods are almost what you wanted he will tell you to “watch the shop” and disappear around the corner before coming back five minutes later with exactly what you asked for. However, if you after this nice initial conversation start hinting that sadly you won’t be leaving your durries in this particular stand today, you are no longer Mohammad’s new best friend. Instead, you are told that you have kept the poor man busy for a whole twenty minutes (even a dedicated scarf lover would have a hard time spending that long) and that you kind of owe him to buy something. Gone are the smiles and coincidentally this is normally the moment English and French are substituted by Arabic which then leads us to assume that our short friendship has ended as abruptly as it started. As rude as some locals come across to us we do of course realise that there are many different ways of expressing oneself. Different is rarely worse. Still, we’ve learned to go against everything our mothers have taught us about good manners and flat out ignore any sellers who dare target us as this is honestly the only way you can enjoy the marvel that is the souk. Asking for directions in the street or maybe a good place to eat is also something we’ve consciously kept to a minimum after our first couple of days here since we’ve ended up at a relative’s spice shop a few too many times. 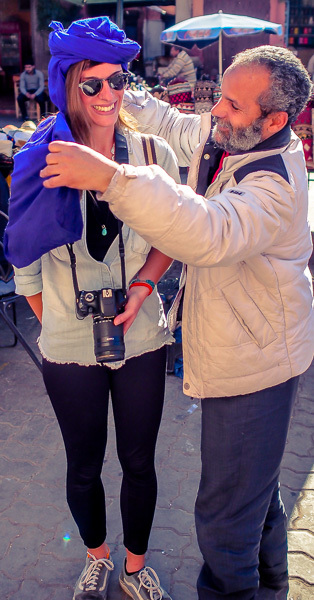 In addition to the souk the Jamaa el Fna square is definitely another mind blowing experience to be had in Marrakesh. The square seems to be a two-sided roller coaster that runs day and night on end. If you go during the day, you’re in for a ride of delicious, 4 dirhams fresh orange juice, fake watches and henna-painting to the mesmerising sound of the snake charmers’ flutes. As exotic as the latter sounds it’s actually a couple of sneakers-wearing men sitting around in the shade while a few snakes sunbathe waiting for tourists to pay for a little show. By the way, you really need to fine tune your street photography skills if you want to take some free sneaky pictures since these people have impressive peripheral vision. 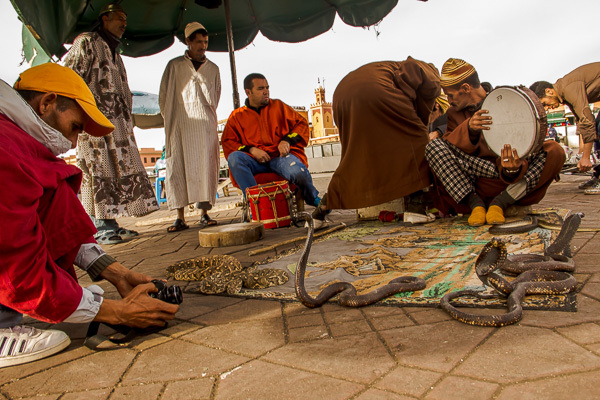 In any case, despite the obvious lack of authenticity, it’s still the first real-life snake charmers we’ve seen in our lives so we’ll settle with that for now. On the other hand, you decide to go at night, you better buckle up as you are about to witness story tellers, singers, dancers, and bands all performing simultaneously before groups of spectators moving between the acts. Sadly, our notions of Arabic are non-existent so we missed out on the details but even then it’s quite an experience. After this immersion in local culture the guys at the food stalls will most likely do their best to lure you in and although the food actually looks pretty tasty you can get your couscous or tajine elsewhere for less. Instead, we went for post-dinner ginger teas a few times and one night Liam, being the adventurous eater that he is, tried a bowl of boiled snails which even he had to admit was disgusting. On a more serious note, we later found out that the square was also the site of a 2011 bombing which probably explains the discrete but constant police presence. In between strolling aimlessly around the souk, sipping tea on Jamaa el Fna and reading on the hostel’s roof terrace we somehow also found the time to make some new lovely friends (thanks to Ramona and George for putting up with us!) 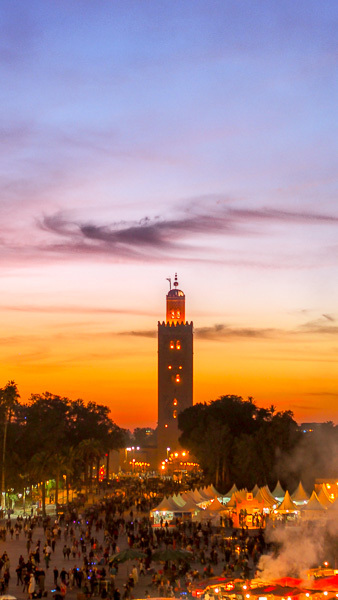 and visit a few other sights of interest in the city such as the Bahia Palace, the Majorelle Gardens and of course the Koutoubia mosque where we had the trip’s best sunset so far. 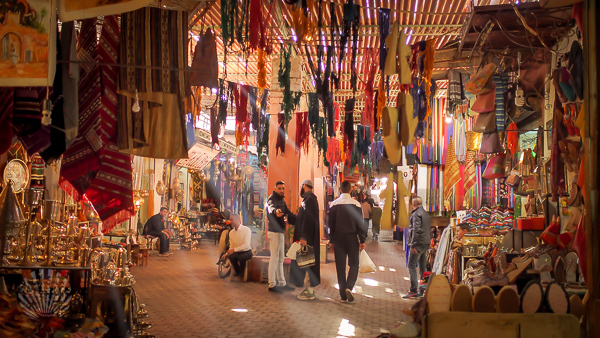 These are all interesting outings but the souk and Jamaa el Fna are definitely where you should spend the majority of your time in Marrakesh. My Name is Manuel. I’m young student keen on to know morrocco this summer in short two week trip without spending like you used to do. Luckily, I ve found your internet blog. And first of all just want to say; Thank you guys for this great blog! It helped me a lot take my decisions where to go. Reading your blog and thinking/planning my trip, I came across some questions. I would like to do to the mentioned desert tour to the erg chegaga. You mentioned the nice desert camp of brahim. According to your descprition about those you woul totally recommend to a authentic desert trip with him. however you mentioned that there are other cheaper tourguides in town (300Dh per day instead of 450 per day offered from brahim and his friends). Would you say it s worth to pay this 150 dh more per day? And how trustworthy would be others? In additon as half carribbean guy I’m great lover of beatiful beaches and seafood. So it would really love to enjoy a few days at the beach of immesoune. I’ve already written the recommended beach hostels a week ago. But they haven’t answered me yet. Do you think they will answer me soon? Because the time is flying me away and I have to my flight before it get quit expensive. The other tour guides in town should be fine, they all do the same kind of tour, but like we said we went with Brahim because we liked them and wanted to spend ours with them. In your case, if you just want the cheapest I would go to the town and find something. The problem with that is you won’t be able to pre-book it. If you do want to pre-book it via the internet it normally is a little more expensive. You should be able to call or whatsapp Brahim on +212 6 2128 1106 to find out more info about what he’s doing these days and his prices. Good to hear you like the sound of Immesouane 🙂 that place was amazing! We heard from them a few months ago they were still going strong. The hostel/town didn’t really have internet so it might take them a while to reply. Again, you might have to not pre-book and roll in and hope for the best haha If they are full on the night there are other places in town you can stay until they have beds.